One of the simplest ways to ensure a tire is putting the optimal footprint on the ground (therefore maximizing productivity and traction while minimizing soil compaction and fuel consumption) is by checking the tire manufacturer’s load/inflation table. To calculate proper tire inflation using the load/inflation table, it’s necessary to know the weight of your tractor, the weight of its load, and the speed at which it will be traveling. With the proper pressure tabulated, simply adjust the tires to the recommended inflation pressure and begin reaping the benefits. In our Tireside Chat: The Value of a Pressure Gauge, ATA’s Ag Product Manager, James Crouch, demonstrated how an overinflated tire will have a smaller-than-optimal footprint which can lead to issues ranging from uneven wear to long-lasting soil compaction. Likewise, an underinflated tire will also perform sub-optimally and will wear much faster than a properly inflated tire. Evenly distributing machinery weight across each axle is also key to ensuring each tire puts down the correct contact patch. Ballasting a tractor helps keep it in balance in the field, ensures each tire is producing its optimal footprint, and delivers maximum traction for both the front and the rear tires. While liquid ballast is still used, cast iron weights are preferred. Alliance farm tires (and most other modern tires) are designed to operate inflated with air and adding liquid ballast will affect how the tire flexes—changing the tire’s footprint and leading to irregular wear. If having the largest footprint for a tractor is preferred for increasing traction, reducing slippage and fuel costs, and minimizing soil compaction, it would stand to reason that buying the biggest tires that fit would be the best. This assumption, however, is untrue. 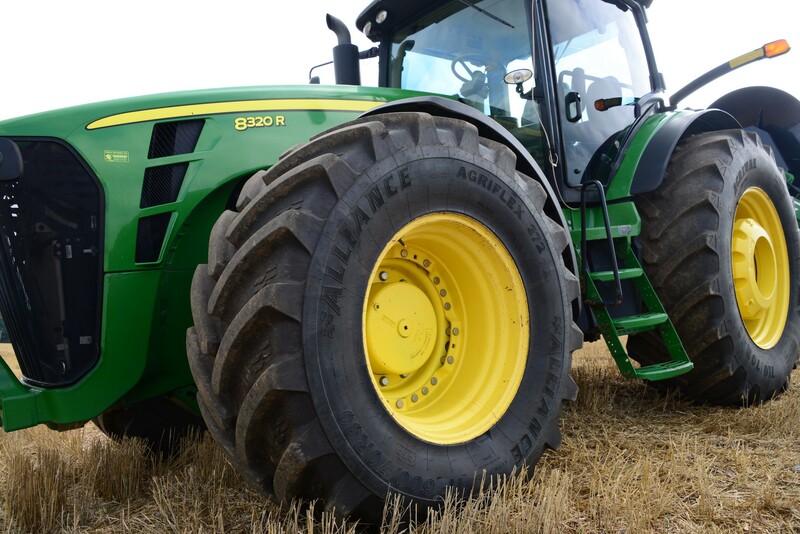 Purchasing too big of a tractor tire can increase upfront costs with no performance benefit. When a tractor is unable to exert enough downward force to produce an optimally sized (nominal) footprint, everything from loss of traction to increased wear and soil compaction will be the likely results. The lesson here is to talk to your dealer about getting the correct size, then work to maintain the optimal footprint for that tire. Keep reading about the pitfalls of over-tiring your tractor in Tire Tales: Too Much Tractor Tire. A tractor tire’s optimal footprint is an ever-changing equation and operators who want to make the most out of their machines and their tires should get in the habit of consulting their tire manufacturer’s load/inflation tables whenever they’re altering the load or application of their tractor. Though it might seem like a small annoyance, making sure your tires are producing the perfect-sized footprint can lead to big gains! For example, The USDA’s Agricultural Research Service finds that properly inflated tires generate nearly 25% more pull than tires running at higher pressures. To learn more about Alliance’s tires—or if you need help maximizing the footprint of your farm tires—contact your local dealer or Alliance representative today.